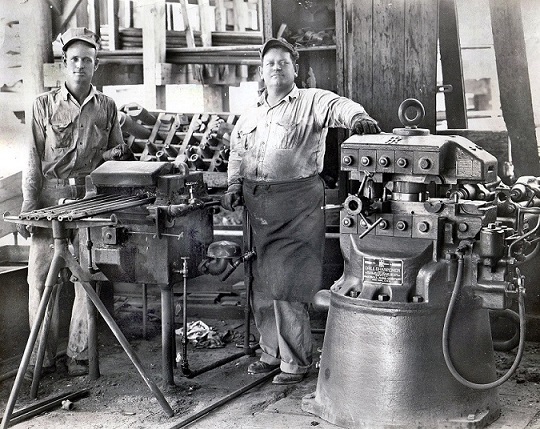 William Hiram Perkins, right, and a coworker in the Miller Dam metal workshop. Terrell Perkins studied blacksmithing at Austin Community College to learn how to use the tools that were handed down from his grandfather. Terrell Perkins was digging up his family history in 2000 when he discovered a treasureâ€”his grandfather’s blacksmith tools locked away in an uncle’s storeroom, diligently maintained but then forgotten. “I found that an old uncle who died years before had saved my grandfather’s blacksmithing tools,” Perkins says. His grandfather, William Hiram Perkins, was a blacksmith in Central Texas in the 30s. He worked on the Miller, Mansfield, and Buchanan dam construction projects for the Lower Colorado River Authority. Terrell Perkins learned blacksmithing at Austin Community College. He now teaches classes at his shop in New Mexico. The discoveries, combined with further research, sparked Perkins’ interest in blacksmithing. He enrolled at Austin Community College, which offers a nationally renowned welding program for technical welders, metal artists, and blacksmiths. “I was looking for a place to learn blacksmithing, and somebody finally said one of the best programs in the country is at ACC. There are people coming from all over the country to do the metal art program,” Perkins says. Perkins creates commissioned artwork as well as freelance pieces that are sold in several local galleries. 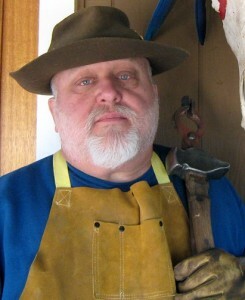 He also teaches blacksmithing classes for Eastern New Mexico State University. “I have a graduate degree in psychology that I used years ago, but I wanted to do this. I needed that creative outlet,” he says. Now, using a hammer he made at ACC and his grandfather’s tools, he expresses his creativity as he forges a connection to his past and to a time-honored tradition. 2 Responses to "ACC Grad Turns Blacksmithing Legacy into Present-Day Passion"
Very nice article, Terrell. Best of luck in all of your future endeavors! Enjoyed reading the article. Very glad you are keeping the family history alive AND you have the natural talent to keep it alive. I come from a long line of woodworkers but the talent did not pass on so I am just happy reading the history. Keep up the good work!